Dunwoody council members John Heneghan and Doug Thompson address their district 3 constituents at a citizens’ connection meeting. Photo by Lauren Ramsdell. 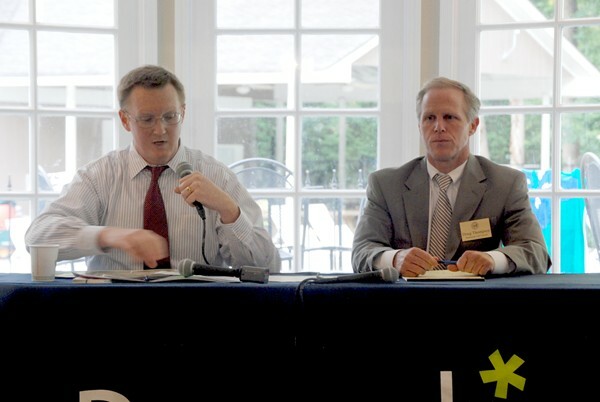 At a the District 3 Citizen Connection Meeting May 29, hosted at the Dunwoody North Driving Club, Dunwoody City councilmen Doug Thompson and John Heneghan answered questions about Dunwoody’s future plans. As has been the case lately, many questions were about proposed parks and road improvements in the area. The final park in the Project Renaissance redevelopment, Pernoshal Park, began its project phase May 29 after final consensus earlier this year in January. The park continues the multi-use trail from the newly-opened Georgetown Park and will connect eventually to the trail at Brook Run Park. The new park will be geared toward older children and families. The smaller use court may be outfitted for pickleball, a rapidly-growing racquet sport. The park has been partially budgeted for this year, with the remainder proposed for fiscal year 2015. Heneghan, Thompson and other Dunwoody elected officials in attendance indicated that the proposed Treetop Quest amenity at Brook Run Park is likely to be approved by the council. Councilmembers were approached by Treetop Quest Inc., a French company that constructs arboreal obstacle courses, to put one of the courses in an underused area of Brook Run Park. After opening the bidding process to other companies, Treetop Quest was the only applicant. Councilmembers visited the Treetop Quest facility at the Gwinnett Environmental and Heritage Center to try it for themselves. Heneghan further said that the city is in negotiations with the company to set a ticket price. Residents at the meeting expressed concern about the use of park land and the potential increase in traffic in what is mainly a residential area. Dunwoody Mayor Mike Davis was in attendance, and according to Thompson “led the charge” when the council tried it out. He and others said that it wasn’t a theme-park type amenity that would draw huge crowds and many cars. Councilman Denny Shortall stressed the nature of the partnership that would be in place between the company and the city. Treetop Quest will build, staff and maintain the facility while providing a small amount of money to the city in return. There will be no tax money spent on the facility. Comparisons were drawn between this new facility and the skate park and dog park already at Brook Run Park. Much like the skate park, which was also staffed by an outside company, the canopy tours will operate outside of the government. It was compared unfavorably to the dog park, which was constructed as a draw for those outside Dunwoody and many residents view as a nuisance. Also on May 29, Gov. Nathan Deal announced a grant to help improve the Tilly Mill Road intersection with North Peachtree Road. The city will receive $784,000 to improve traffic flow in what can become a congested intersection. Construction is expected to begin in 2015. The proposed plans include adding left turn lanes and signals, extending right turn lanes, adding a stoplight at the intersection of North Peachtree Road and Peeler Road and synchronizing that light with the existing one at Tilly Mill and North Peachtree. Also planned are on-street bicycle lanes, improved or added sidewalks and a grass buffer between the sidewalks and the bicycle lanes.